Theatrical critics applauded the scenery and effects of The Vampire. The European Magazine and London Review said they "demand[ed] a particular notice", specifically pointing out the effects of moonlight and sea, presenting a "coup d'oeil ... rarely, if ever seen excelled." 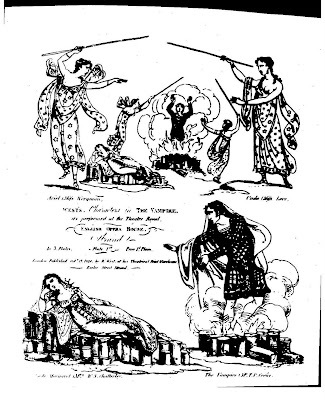 This handbill for the 1820 production of The Vampire shows two moments from the Introductory Scene, and even from this black-and-white line drawing, we can imagine the effect of T.P. Cooke's appearance in fire and smoke in the dark Caves of Staffa. For centuries demons, witches and ghosts had appeared through the stage floor by means of trapdoors. The English Opera House, for The Vampire, invented a new device of two rubber doors held shut with sandbags as counterweight; an actor would press quickly through and the weights snapped the doors immediately shut, giving an effect of the actor having melted through a solid plane. With blue fire and smoke, the actor seemed to materialize out of thin air. The "vampire trap" (or "trappe anglaise", in France)became a standard device for supernatural appearances. The Review tells us Cooke as Lord Ruthven "sinks through the stage in a scene of terrific grandeur." Theatre history was made.